The Telemetry Distribution Board is a very useful addition when you have multiple devices to connect to your telemetry output, with this distribution board you can separate RX/TX signals between multiple devices like Minim OSD, IO Board, Radio modems etc. The Telemetry Board connects to your MAVLink (ArduPilot Mega) capable Flight Controller and you can easily connect several devices without having the problems of splicing and soldering the wires together. 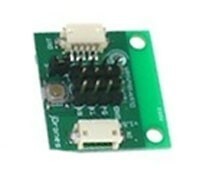 The Telemetry Distribution Board has IN / OUT connectors as DF13-5P and 3 x 4 pin headers. If you have OSD and or IO Board connected and no telemetry modem, you can leave small jumper on. If you have OSD and or IO Board and telemetry modem connected, take out jumper to have normal operation on telemetry modems. 1 x Assembled jD-Telemetry board. 1 x 10cm extension cable.